Thomas Maxwell Wagg, age 27 born in Mindemoya, Ontario and resident in Mindemoya, Ontario and son of Francis Wagg and Elizabeth Ann Cook married Jane Hodson, age 25 born and resident in Mindemoya, Ontario. and daughter of George Hodgson and Jane Williamson. The date of marriage was either the 15 or 18 of June 1905 (I think it is 15 and the indexer says 18). It was not registered until 18 July 1905. The photograph was taken by a Gore Bay photographer. Thomas Wagg - Jane Hodgson Ontario marriage registration #004151 (18 July 1905) Ancestry.ca (http://www.ancestry.ca/ ; accessed 8 February 2009); citing Archives of Ontario microfilm MS 932 reel 117, Toronto. Thomas Wagg's father Francis Wagg - 5th marriage married my great great aunt Sarah Hillborn nee Vincer 1 November 1921. So although not related there is a family connection. 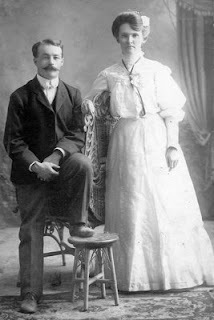 My great uncle Isaac Maurice Johnston married Thomas' sister Frances Margaret Wagg. 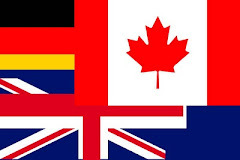 For more about the Wagg and Hodgson families check Manitoulin Roots This site led me to the following information. 1906 was a very sad year for the Wagg family on the Manitoulin. This beautiful couple both met an early death. On 21 May Jane's baby boy was still born. Six days later Jane died of confinement. On about 24 November Thomas drowned on the Steamer Jones. When I chose this photograph, I didn't know the story was going to have a sad ending. You're right..that is a beautiful wedding dress! With such early deaths it's a good thing they were photographed here. Such a sad story. There seems to be a sadness in her face that I saw when I clicked on picture to enlarge it. I believe sometimes there is a foreshadowing of tragedy that one experiences. She was a beautiful bride in a beautiful gown. A very handsome young couple. Thank you for sharing this with us. As I mentioned in the article, I didn't know when I start researching the couple that they had such a sad ending. I thought I'd see if I could see if I could find out a)if there was any family connection and b)if I could find any records for them. As always in research, you never know what you are going to learn. Interesting photo and story, thank you, Janet.